Even though I feel like I visit here all the time, Vancouver always makes me feel really excited. Recently, I’ve been working in Tokyo a LOT: Riding trains that are packed to their limits, and getting lost amongst the streets in Shibuya. 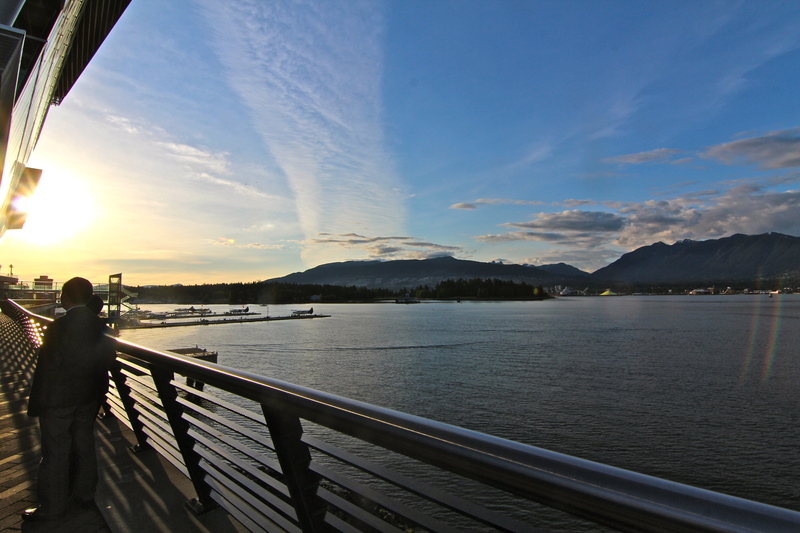 Just a single 8-hour plane ride away from all of this, you will find, Vancouver. 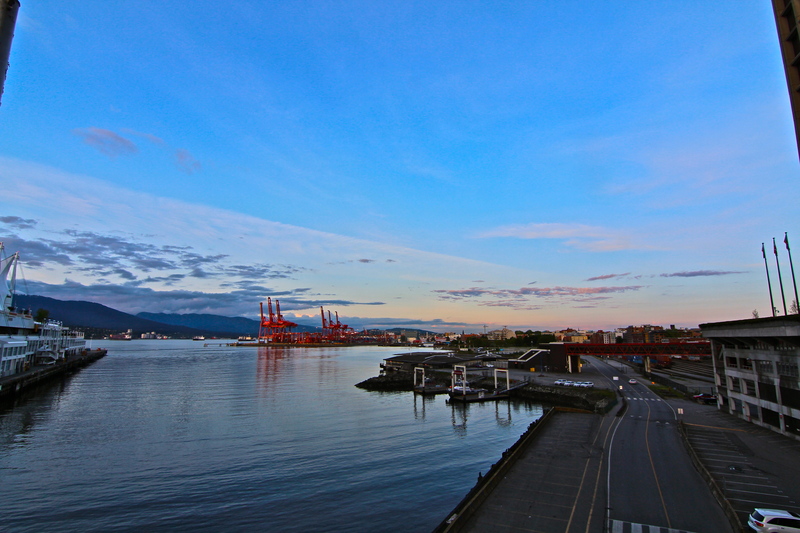 Vancouver often thought of as the “major city” of the West Coast of Canada. And obviously, this is NO Tokyo. Off the plane, the SkyTrain takes you directly to downtown. 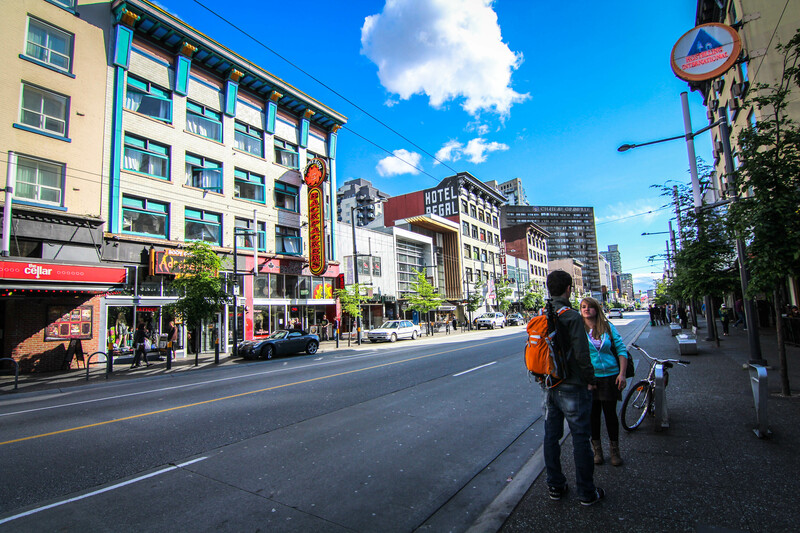 Hop off that SkyTrain, and you will be astounded by the difference between the two cities. 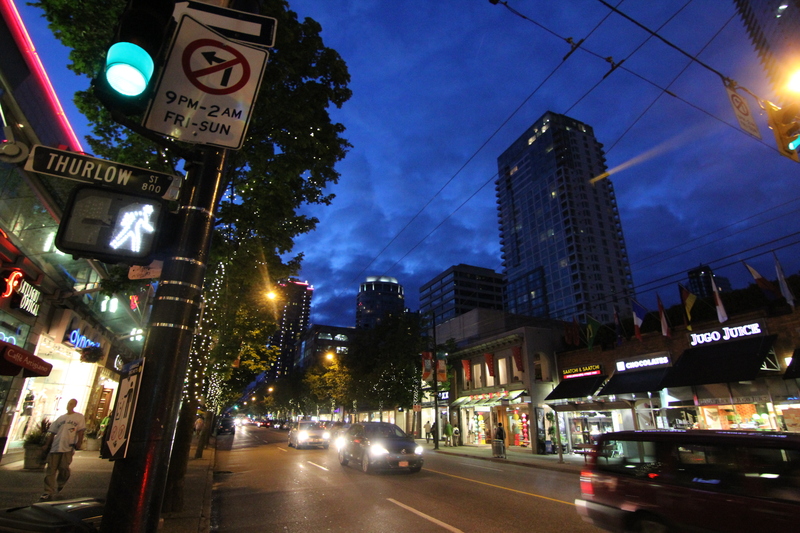 One of the central streets downtown, “Granville Street.” What’s this? I don’t see any people. 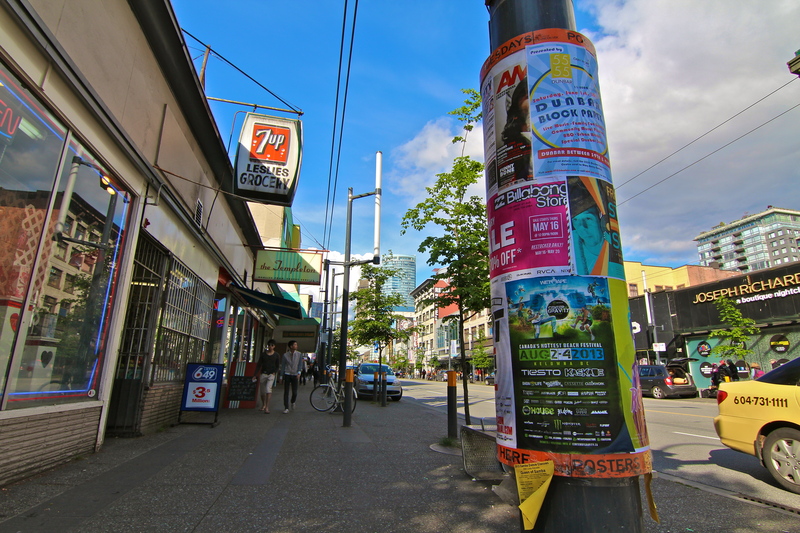 Actually, Tokyo and Vancouver don’t really differ in area. In fact, Vancouver is just a little bit bigger. But I actually read that the population of Tokyo is 6 times that of Vancouver. It feels so nice to walk in wide, uncrowded streets. 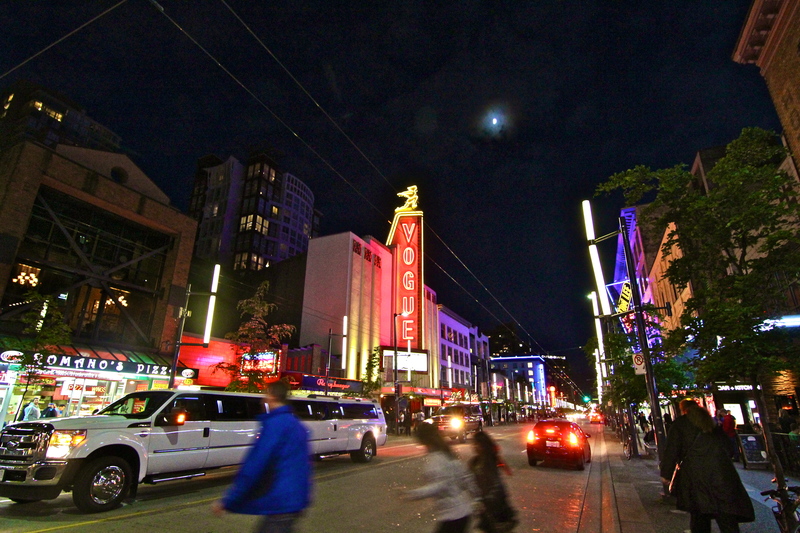 This street, Granville Street, really tends to come alive at night. It’s not uncommon to see limousines driving around, treating it’s passengers to a celebrity lifestyle. And there are often lineups to get inside the hottest clubs and bars. 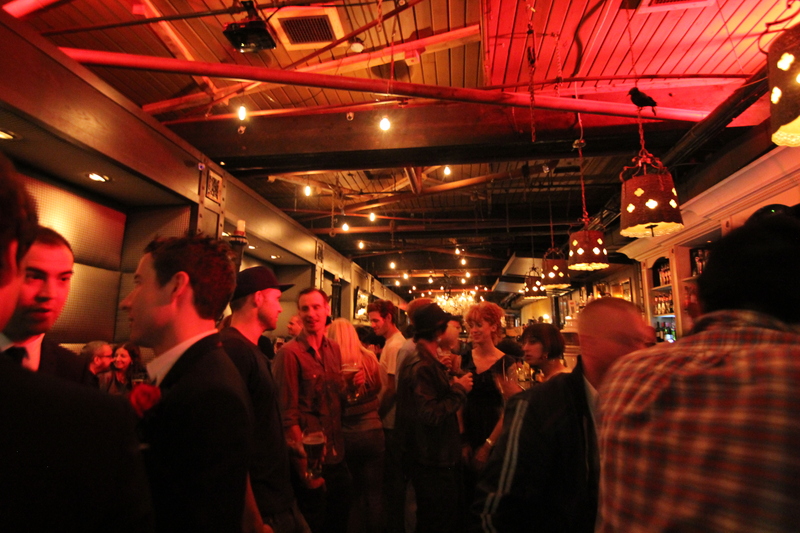 Once you actually get inside a bar, they are buzzing with young (good looking) people. Aside from drinking, there are lots of other things to do downtown. 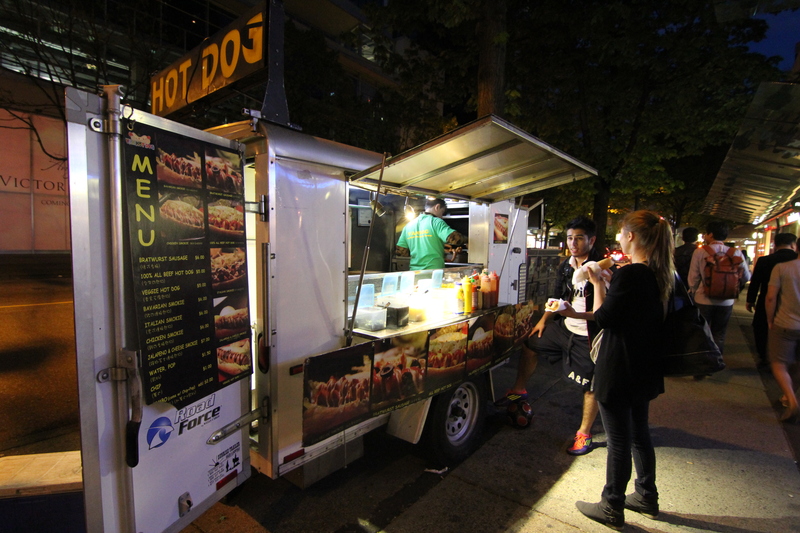 If there are Western Style hot dog stands…. 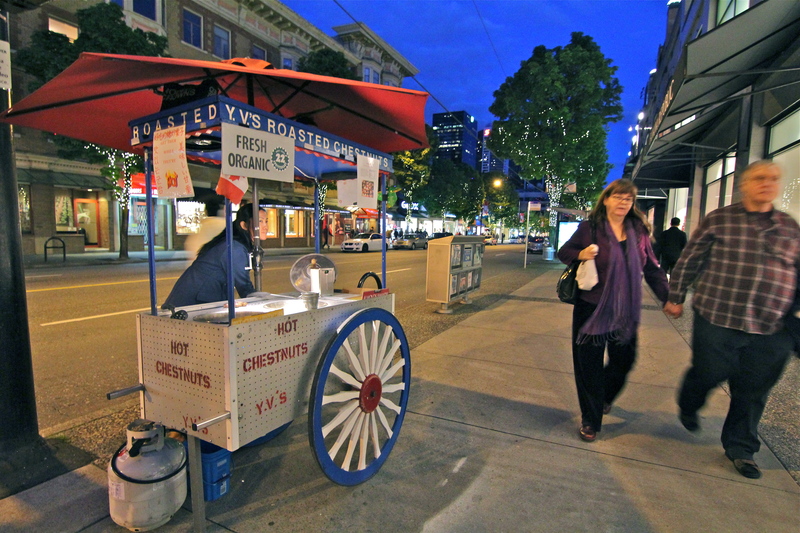 There are also comfort foods such as roasted chestnuts, sold on the city streets at night. 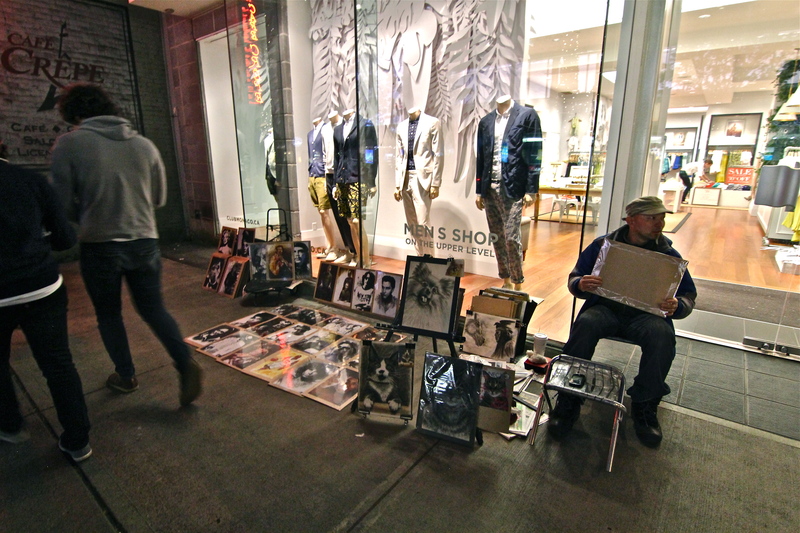 And I don’t mean to necessarily say that night time in Vancouver is noisy. It really depends on the street you’re on. By the way, the sky sure looks bright doesn’t it? I actually took that photo at 9pm at night! But in Japan, it’s pitch black by 7pm. We don’t do Daylight Saving’s Time. Anyway, I was busy last week, but I’m finding healing time in Vancouver. I hope you will find yourself visiting Vancouver someday too! If you want to follow our trip in real time, make sure to follow the CTC on Tumblr! I’m also posting on twitter under the hashtag, #ExploreCanada! Posted in Canada, Micaela, Tourism, TravelTagged わーきんぐ, カナダ, カナダ観光局, ガイド, クラブ, グランビル, ストリート, ダウンタウン, バンクーバー, バー, ビザ, ホリデー, ミカエラ, リュ学, ワーキング, ワーホリ, Blog, Canada, Canadian Tourism Commission, ciaela, 留学, Downtown, English, ExploreCanada, 英語, Granville Street, japanese, Micaela, Nightlife, Party, Pictures, Tourism, travel, Vancouver, 合流, 掘りディー, 旅, 日本語, 海外Bookmark the permalink. Oh also I guess you might also be Canadian… But whatever ! Hi Micaela, a great blog as usual! 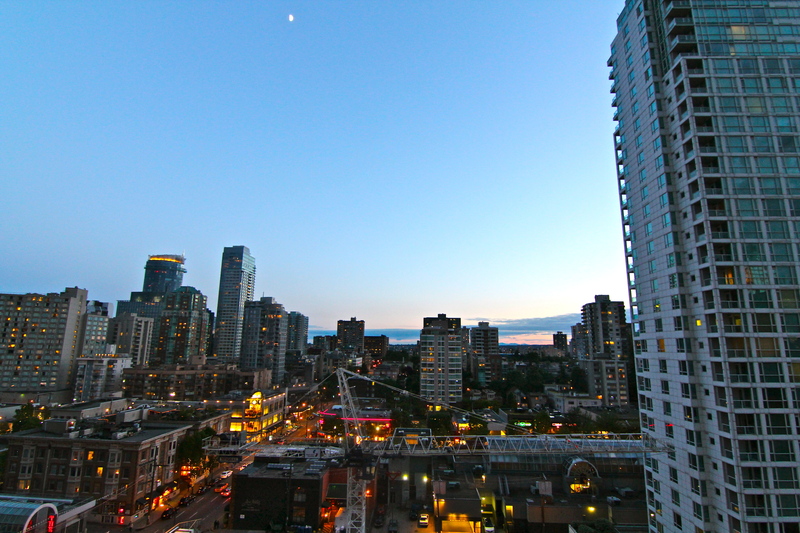 I haven’t had a chance to visit again, but I have been to Vancouver a few times, and I love it too! Your article made me want to get up there again! Hi, I like your blog　on You Tube so much.At first, I watch your blog to practice listening to English. But now, your bog attract me to be fun and interesting.So please keep on making a blog! I have a request for you. I’ll go to Toronto next July. So please tell me the good place for tourism. I have a plan to stay Toronto for 2 month.So It is OK to be a little far from Toronto. I used to visit vancouver when i was in Bellingham!